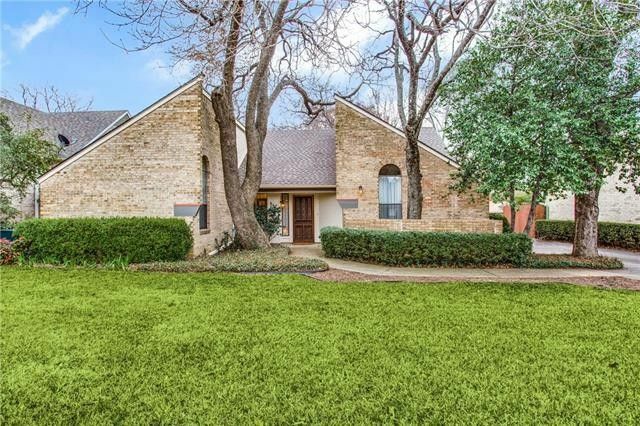 Within walking-biking distance to the UNT Campus & on a quiet tree-lined cul-de-sac, this updated single-story brick home offers an elegant 29X17 greatroom with stunning wood floors & a wall of windows for enjoying the private wooded yard. The heart of the home, the upgraded kitchen offers granite countertops, stainless steel appliances & a breakfast bar open to the breakfast room & large tiled sunroom with lots of windows. Terrific storage throughout! The secluded master suite offers a new over-sized shower, L-shaped vanity & large walkin closet. On the opposite side of the home, the spacious guest suite includes a 13X12 bedroom, updated full bathroom & a private study-living with computer niche. ELITE HOME! Directions: South on North Texas Blvd, turn right onto Highland Park Rd. Just past the duck pond, turn left onto Highland Park Circle. 1917 Highland Park Circle is on the right side down the culdesac. Exclusions: 5 decorative mirrors, sconce(battery) in master bath, guest rm curtains, sheers, 2 cabinets in breakfast room.